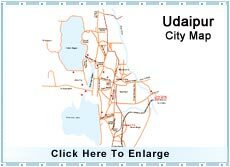 Here is presented the map of Udaipur city. Check out Udaipur, India maps. This section comprises the Maps of Udaipur that will ensure the exact location of Udaipur city. If you are planning a trip to Udaipur, you can check with Udaipur, India Maps to get a transparent idea about moving in the region of Udaipur. These maps will prove to be of great help, while locating the landmarks and major tourist attraction destinations. You can easily plan out your sightseeing trip with the help of these maps. Udaipur Maps will provide you a close view of the marvelous city of Udaipur, which displays a wonderful blend of the royalty and picturesque scenery made by the lakes. Udaipur is famous for its ancient roots and beautiful surroundings. Every year, people across the Globe come to visit this city of lakes. Maps of Udaipur are particularly helpful for those, who are completely fresh to this city and have no idea about its location and places. So, here is presented Udaipur Map to aid you in locating important roads, landmarks and consequently making your journey hassle-free.